The Georgetown airport sits close to town on a ridge that looks over the vast Canyon Creek watershed on its north side. An easy trail can be found that encircles the entire landing strip and many other trails take off from the northwest corner of the landing zone just beyond the picnic area. The trails drop into Canyon Creek and provide access to Bottle Hill Road, Mamaluke Road, and an unlabeled road once known as Odyssey Falls Road near the vineyard. The Odyssey Falls road has had a 2008 CC easement until recently when the land went on the market. Only time will tell if that route stays available. But before the easement a nice but steep tie trail cuts down to the Robie trail near Canyon Creek. Canyon Creek is a quiet stream for most of its length but has a few good swimming holes and waterfalls scattered along its way. The creek drains an extensive area encom-passing land from Balderson to Breedlove along Bottle Hill and finally to the Middle Fork of the American River. The creek was once accessed down Canyon Creek Road until the homeowners along there decided to gate it to the public. Then we used Mamaluke Road to get there until recently that also has been gated. For pity sakes! Good thing we like to walk. 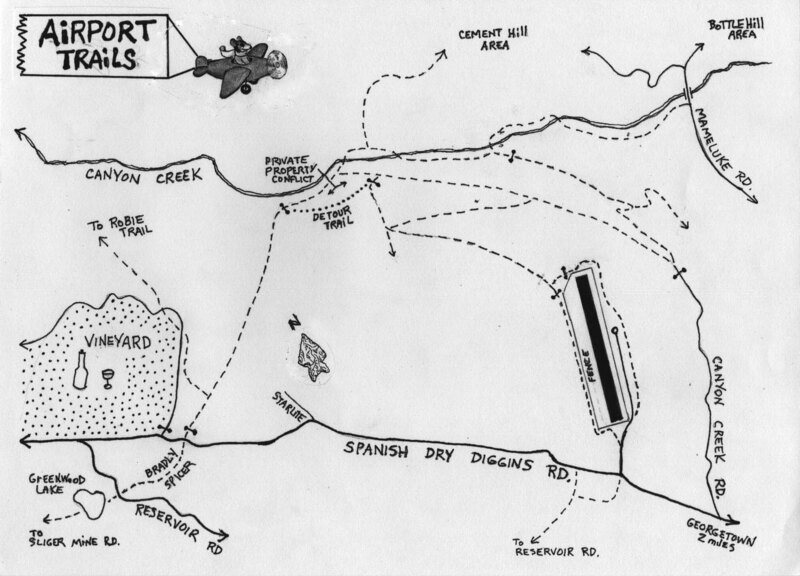 The airport trails are also gated but were bought and erected by the El Dorado Equestrian Trails Foundation (EDETF) who is responsible for most of the trails around the airport. Parking is available at the N/E corner near the monument and aviation club area. A sign points to a hiking trail link from the parking area. You can also park near the restrooms and picnic grounds on the west side of the airport.